This presentation focuses on E.C. Rosenow's demonstrations of the involvement of a characteristic streptococcal infection in a number of distinct mental-associated conditions, with particular emphasis on a category he referred to as "mental deficiency". This raises the question of potential implications for modern categories of "cognitive impairment", etc., including the possibility of inhibiting or even reversing the involved debilitative processes. C. Rosenow's "Mental Deficiency" Category Relative to the Term "Cognitive Impairment"
A. Remove the "nest", or "focus". -- his 1955 article's data for a range of neuropsychiatric categories, including a category termed “mental deficiency” that strongly implicated a characteristic (oral-based) microbial infectious cause. (2) whether remedial action implicated by Rosenow for a range of systemic infections might yield positive results in the case of such “cognitive impairment” (i.e. detecting and removing any persistent oral infections, in conjunction with specific preferably-autogenous vaccine). In this instance, mention was made of "too many teeth" as causing some tooth removal and consequent irregular spacing. The term "hyperdontia" refers to "one or more extra" teeth. Regardless of the cause an oral irregularity, the case for this circumstance being the inciting factor underlying "cognitive impairment" (as a secondary, nervous-system-manifestation, infection) is persuasive, as discussed in Sections II and III below. As such, ameliorative possibilities become evident, as discussed in Section IV below. As most prominently established by Frank Billings MD ("father" of American medical education and President of the AMA 1901-2; Focal Infection; The Lane Medical Lectures, 1915), oral infections, i.e., primarily infections in and around teeth and/or tonsils, can and do spread, primarily through the bloodstream, and can cause and/or aggravate disorders elsewhere in the body, including the brain. Such oral infections commonly (nearly exclusively) serve as primary infection sites; distal sites are generally secondary to a primary (oral) site, except as directly caused by injury. The appropriate remedy for such secondary site infections would thus involve either or (preferably) both eradication of infection in the primary site in combination with specific vaccine-therapy. 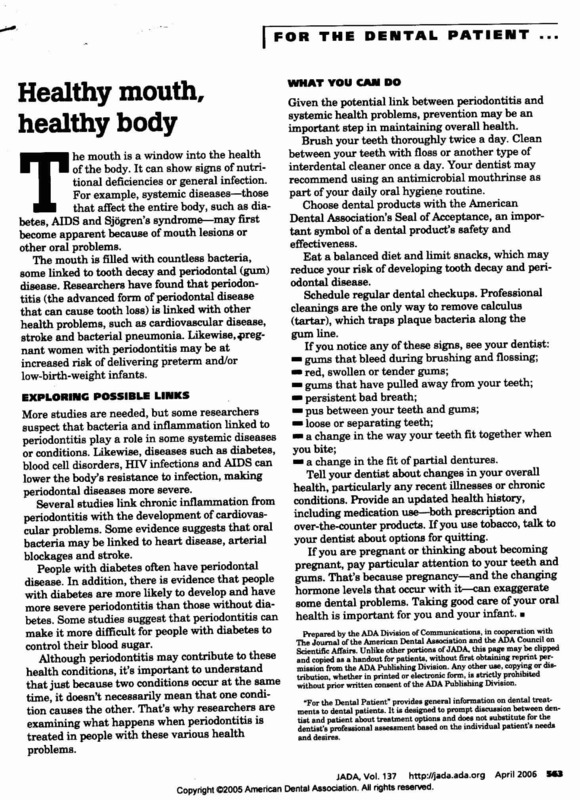 A 2006 article in the Journal of the American Dental Assoc. provides a summary discussion :JADA 137 (2006) jpg. Indeed, hundreds of thousands of items are accessed with internet search terms: oral infections and systemic disease; e.g. http://cmr.asm.org/cgi/content/full/13/4/547 refers to atherosclerosis, myocardial infarction, stroke, infective endocarditis, bacterial pneumonia, low birth weight, diabetes mellitus, etc., including thousands with reference to nervous system disorders. A structural abnormality, oral or elsewhere and whether or not initially incited by an infection per se, nonetheless comprises a potential "locus minoris resistentiae" susceptible to microbial invasion. Thus an abnormality within the fetus may acquire and/or harbor an infection with systemic ramifications. Even without Rosenow's and Price's proofs of the oral as primary and systemic as secondary, the preponderance of literature on the subject would logically suggest that, given the fact of common associations (i.e., oral with this, oral with that, oral with other, etc. ), the oral is primary and all the other various systemic conditions secondary, rather than a host of systemic conditions all converging and causing the oral. In recent years, interest has been growing within mainstream psychiatry field regarding the relation between infections and psychiatric disorders. Rosenow's work is not yet known or integrated into this mainstream trend, except as communicated in this review of a book proposal by U. Minnesota's S.Houssein Fatemi MD, written in response to an invitation by the originally-intended publisher John Wiley (London) [Fatemi6-13-04.htm]. This review comprises a detailed reconciliation of these modern psychiatric research trends with the works of Rosenow, et al. Any reference to discussions of this topic over the past century or so must also include reference to Upson's Insomnia and Nerve Strain (1908), and Henry Cotton's The Defective, Delinquent and Insane... (1921) that cited Rosenow's early work as already somewhat definitive. But it was the later, extensive work by E.C. Rosenow in the mid-20th century that provided the seemingly incontrovertible immunological proofs of such a relation. Particularly toward the end of his tenure at Mayo and during the decade following, Rosenow focused primarily on nervous system infections, with emphasis on schizophrenia and epilepsy, and including fine-tuning of differentiation between various types of nervous system disorders [see Shakman-History-Rosenow.pdf]. Without emphasis, fanfare or even any direct comment (here, or elsewhere in his writings, as far as I have seen), the data in this article nonetheless includes particularly striking results for a category labeled “mental deficiency” – i.e., rather unequivocal and substantial evidence indicating those cases studied were caused by an infection. p. 324, Table 4 (re agglutinative titer of blood serum), for the category "mental deficiency" (including 21 cases), the "agglutinative titer" of blood serum correlated with schizophrenia closely mirrored and even exceeded that for each of seven other categories of neurological impairment (totaling 354 cases), in stark contrast to and far in excess of results for "well, non-contacts" (13 cases) and "brain syndromes due to syphilis" (27 cases); and compared to all of the aforementioned 8 categories of neurological impairment (including the mental deficiency category), the agglutinative titer for respiratory infection and enteritis were uniformly much lower. The strong implication here is that, at least for these 21 cases of “mental deficiency”, the mental impairment is caused by infection. p. 324, Table 5 (re agglutinative titer of spinal fluids), for the 7 cases of "mental deficiency" in this part of the study, the agglutinative titer of spinal fluids, similarly correlated with schizophrenia, also mirrored that for 5 other categories (total 79 cases) of neurological impairment; again, compared to all of these, agglutinative titer for respiratory infection and well persons were again uniformly much lower. As discussed on p. 330 in Summary and Conclusions, these results were considered to have "corroborated and extended" Rosenow's previous results on the etiology of schizophrenia and related mental disorders; see the cited references in the article for further discussions of Rosenow's extensive previous studies on the subject of schizophrenia, epilepsy and related disorders. It must be emphasized that these extensive studies, consistent within Rosenow's huge body of work, invariably implicated oral infections primarily in and around teeth as nests/test-tubes/safe-havens for infections; which infections drain into the circulating blood and may cause disease processes elsewhere, including nervous system afflictions. P.H. Pearson, MD, in the journal Pediatric Clinics of North America, 1968, discussing "mental retardation", seemingly corroborates the two essential conclusions of Rosenow's monumental studies as concerns (1) the infectious nature of a range of systemic diseases including neurological disorders, and the idea that a category of "mental deficiency" may be grouped therein; and (2) oral infections in and around teeth as reservoirs for infectious processes throughout the body, including the nervous system. 1. Viewing the second part of this one page excerpt, "Immunizations", it is striking that the precautions discussed are all indicative of the existence of infection; if the therein-referred "mental retardation" conditions were strictly physiological-mechanical and unrelated to infection, these precautions would seemingly be unnecessary. 2. And the "Care of the teeth" section notes that "a high rate of dental abnormalities in mentally retarded children ... has been noted by several investigators". It's kind of a sloppy muddled paragraph, sandwiching the abnormality sentence between sentences referring to "dental hygiene" and "dental decay"; however, it seems clear even from the way it is stated that the "abnormality" correlation cannot be wholly or even appreciably attributed, if at all, to poor dental hygiene (nothwithstanding the ill-conceived attempt by association to suggest such a relation). Rather, the abnormality of teeth may (in any case, properly) be viewed as providing a classic opportunity for invasion and colonization by infectious agent(s), and emanation therefrom of such agents and/or their toxins implicated in the causation of nervous system infections, as extensively demonstrated by Rosenow and others. Alternatively, these issues (mental and tooth) could theoretically be either independent or related to a common other (mystical) cause. But since the Rosenow perspective is so well documented and can be tested, that would seem to be a logical first step. C. Rosenow's "Mental Deficiency" Category Relative to Term "Cognitive Impairment"
As Rosenow was otherwise very thorough in attribution to specific diagnoses, it seems safe to assume that most if not all of the cases in Dr. Rosenow's "mental deficiency" category referred to developmental disorders (e.g., see Tables 4 & 5, p. 325 in "Rosenow1955-JNervMentDis122.doc"), and accordingly that any such "deficiency" was more properly viewed as "impaired", and specifically impaired due to infection or intoxication secondary to a reservoir oral infection. An infection anywhere in the body, including in or around the teeth and tonsils, can and will spread elsewhere through the bloodstream. Removing such a "focus of infection" is a no-brainer! These links include a number of videos on the subject; numerous additional videos are now posted on youtube.com and other internet locations. Search google for: "Luis Moura" and/or autohemotherapy and/or autohemoterapia. In the case of infections being conveyed through the bloodstream, intramuscular reinjection of freshly drawn autoblood may comprise a specific vaccine of sorts. Judging from an overview of recollections of results in both categories, autohemotherapy as vaccine is not as potent as Rosenow's autologous vaccines, but seemingly works on the same principle. Thus, in lieu of Rosenow's vaccines and/or a means of identifying and eradicating any possible implicated oral "focal" infection(s), this traditional "treatment of last resort" may be worthy of consideration. It is noted that examples in the modern literature of congenital disorders caused by infection abound; e.g., google: congenital infection. An experimental nervous system infection acquired in the womb: In a wholly unrelated article, Rosenow documented how a case of a nervous system disorder, evident at birth, might have been passed from the mother and acquired in the womb. In the South Dakota Medical Journal, Sept. 1952, Rosenow reported that a pregnant mouse, which had received repeated intracerebral inoculation of the suspected pathogen [cultured] from a case of epilepsy had remained well, as did 3 of the 4 offspring; but one of the 4 offspring died in an apparent gran mal seizure several weeks after birth. "This occurrence was first considered as perhaps an example of hereditary epilepsy ... [but] a pure culture of the [suspected pathogenic alpha] streptococcus was isolated from the brain in serial dilution cultures in dextrose-brain broth. The streptococcus from the end point of growth produced spasms in 19 and convulsions in 16 of 22 mice that were repeatedly inoculated intranasally." Rosenow offered no further explanation of this occurrence. A coincidence of tooth and cognitive abnormalities at a minimum suggests the possibility of some common cause, and further that the former may be primary relative to the latter. Beyond prior discussions in this communication of the oral/systemic connection (see Part I above), the huge body of correlating work discussed below warrants even further emphasis in validation of this above-stated relation. Rosenow's work and that of his immediate predecessors, associates and successors, while arguably the most extensive and conclusive grand body of works, is by no means alone. It is noted that Rosenow also demonstrated a relation between oral infections (e.g., BTW even any and all tooth "decay" is infection; fillings help to chew food but do not eradicate infection) and pregnancy complications. Weston Price, in his landmark 1923 book, "Dental Infections, Oral and Systemic", dedicated a full chapter to the subject. If one accepts the possibility that an oral abnormality, e.g. infection, or any even-obscure infection in a mother may cause a systemic problem within a fetus, it is not an inconceivable stretch to understand how an oral abnormality within the fetus itself may acquire and/or harbor an infection with systemic ramifications. Even without Rosenow's and Price's proofs of the oral as primary and systemic as secondary, the preponderance of literature on the subject would logically suggest that, given the fact of common associations (i.e., oral with this, oral with that, oral with other, etc. ), the oral is primary and all the other various systemic conditions secondary, rather than a host of systemic conditions all converging and causing the oral. It is regrettably acknowledged that, even if the foregoing is relevant, Rosenow noted that permanent damage to the system in some long-standing conditions may have progressed beyond the possibility of reversal. Nonetheless, even in such cases wherein a contributory infection persists, elimination or neutralization of it would presumably not be harmful and could be helpful in forestalling further progression of the disease processes.